Good day everyone! 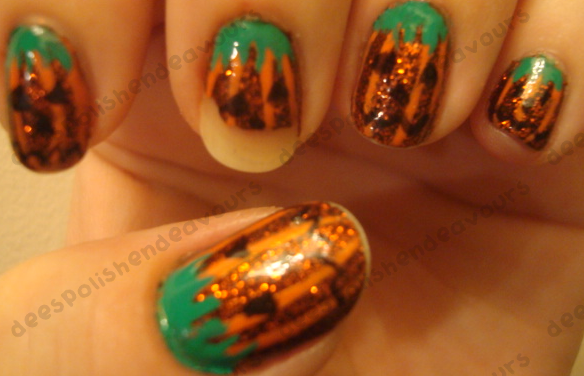 Today I am bringing you a couple of fail nails. I decided to post these up regardless of how terrible they are.. Just to be honest and show that not everything I attempt works out. Here is the first set. Ugh. I think the moons are what I hate the most. These just didn't work. These I actually liked.. Except for the fact that my middle finger chipped after 1 day!! That NEVER happens to me anymore. Sure, I was at work.. But still, usually does not happen after a single day. And I actually should have reversed Ick-A-Bod-Y and Breakin', but oh well!! I really shouldn't even bother painting my nails today as I have a bunch of work in the next week.. But oh well! I probably will anyways. I really want to try that infected stitches look that Dollface posted up the other day!! Hope everyone is having a great weekend! I am going to be enjoying some delicious Thanksgiving supper this evening.. We pushed it back a week to enjoy with the uncle that is visiting.. Turns out that he had to go home early for work, so now one of my friends is going to take his place. OH! And a photo to save this post from being all about fails..
Mr. Bennie and Fonze. Fonze (the rabbit), just hops into Bennie's cage. They are pretty adorable together. 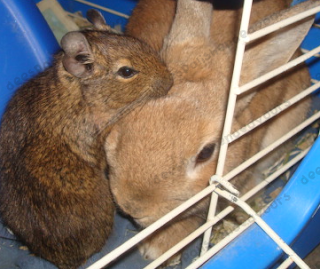 And despite Bennie's rat-like appearance, he is actually closely linked to rabbits. I think Fonze helps to fill the void of Jet being gone. Have a super day all!! Steffie - Thank you and thank you! I am very happy with the haulage as well! Zara - You so should! They get a bunch of compliments!! shortwidenails - I also love Halloween nails - cute ones just add in a fun little mix! OMG! I actually kind of agree with finding the cat (Zachary Binks or Binx?) hot.. It does have a lot to do with the accent! I will definitely post up pumpkin pics. 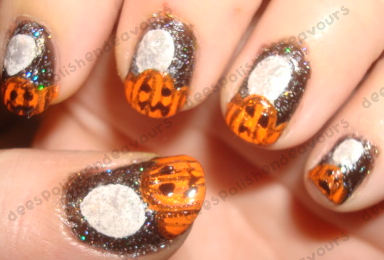 They are usually my pride and joy of Halloween! I just hope I can figure out what I want to carve soon, it is making me nervous!! I am the official candy hander-outter. Plus, I like when I get to hear all the compliments about my pumpkins and decorations. AND hear the mini shrieks when the welcome mat screams at people (: Halloween nails are all I will be posting for the month, so yes, more to come!! ch3rryco1a - Glad you found your way back (: you really should! I would love to see 'em! I love your bun! so Cute that they hand out together. Your bunny is so cute! I got the last Color Club box set there was at our winners. :( I'm hopeful that they get more in stock! I am going to be haunting their beauty section regularly now! :) I almost missed the set at all. Walked by it twice looking for it. i actually like your fail nails. the pumpkins looks really real...3d almost. i was gonna do halloween nails but i've been pumpkin carving too much that my nails are quite ugly now. chips here and there. are there still a lot of kids in your neighbor hood? maybe 15 years ago there were a lot in my neighbor hood but as the kids got older they stopped trick or treating and they never moved from where they lived so no new kids came to the neighbor hood so now there aren't many kids anymore since my neighborhood is all adults/ people over 19. so u watching hocus pocus this year ? you have to!! !